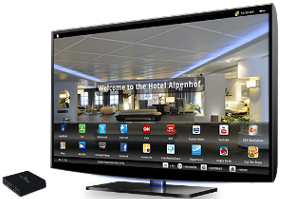 ​Our Smart TV Solution enables a Hotel to update their TV solution inline, without the need for IPTV upgrade. Our new Smart TV solution, is a revolution in the way we can upgrade the in room entertainment within the Hotel Room, to provide additional information on top of a coaxial Freeview based system. Allow your guests to take full advantage of the internet in their hotel room: they’ll have access to interesting apps and can select from a huge range of services, hotel specific informations and entertainment channels. Chatting, surfing, shopping – everything comfortably over their hotel room TV! As a hotelier, you can present your own personalised content or inform about special hotel offers. The records are centrally managed. Hotel guests can use public internet services like journey planners, events, television guides, news magazines, maps, navigation or weather services. The remote is already an exciting experience! The innovative hotel gyro remote is used as the TV remote. It includes a full QWERTY keyboard, gyro function (motion sensor) and also controls the TV. This enables unique handling. HotelMediaShare requires no additional hardware, no cable and no TV application. All what the guest needs, is his mobile phone and the Wi-Fi network. The guest just connects his mobile phone to the system to be able to watch his personal media files on TV. Photos, music and videos in the large-screen format! The device supports all major communication protocols and video and music formats in Flash & HTML 5. Your guests, for example, can access the Second German Television media library or the BBC iplayer. They won’t have to miss any of their favourite programmes, instead they can view them when it’s most convenient. As you know, hoteliers need to provide evidence about the data that guests have accessed using the internet. The system guarantees all use of data retention; the entire Internet traffic on the smartupbox is recorded by each ISP. This means you can always prove what which content a guest viewed in a particular room.